Construction of the first nuclear power plant in the Economic Zone on the West Coast of the Taiwan Straits starts Monday of this week. 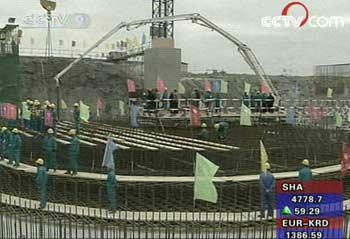 Construction has begun at the Ningde Nuclear Power. Located in Ningde city of Fujian Province, the power plant will also be the first nuclear power house to be built in the Economic Zone on the West Coast of the Taiwan Straits. The first phase begins after 4 years of preparations. Up to four one-million kilowatt water reactor-based nuclear power generators will be installed. All four will use CPR-1000 units, and total investment for this phase totals 50 billion yuan. Li Yinong, General Manager of Ningde Nuclear Power Plant said "The CPR-1000 is 80% Chinese designed. The technology was originally imported from overseas, but it has gone through many transformations, and is now very much our own product." Experts say completion of the first phase of the Ningde Nuclear Power Plant will provide 30 billion kilowatt hours of electricity, which could help ease energy shortage, and boost environmental protection in the eastern regions. Analysts say heavy reliance on coal-fired plants to generate electricity accounts for much of the country's air pollution. This has given Chinese authorities strong incentive to develop more nuclear power across the country. Zhang Shanming, Deputy Manager of Guangdong Nuclear Power Investment Ltd. said "We are very concerned about the safety of our workers as well as protecting the environment. We have more than 4 procedures in place to protect our workers." Experts also point out that China has been very careful to ensure that highly-trained workers and engineers participate in all nuclear projects. They also stress that nuclear energy does not generate polluting emissions such as carbon dioxide, and is relatively reliable compared to more traditional sources of energy.